Pushing further south, we headed from Moncofar towards Javea to meet up with some friends and for Kelpie to get his first experience of “free camping” (not on a campsite or aire). Javea is a small coastal town, turned modern resort, and lies in the shadow of the impressive Montgó Massif mountain, which changes shape and colour in the sunshine as you pass heading towards the town. We arrived in Javea and parked up on the stony beach. The waves were crashing into the beach with some force, even enticing a couple of surfers into the sea. Overnight parking is not allowed on the beach, so we were on the hunt for somewhere to stay. Michelle risking life and limb to get a picture of the waves! 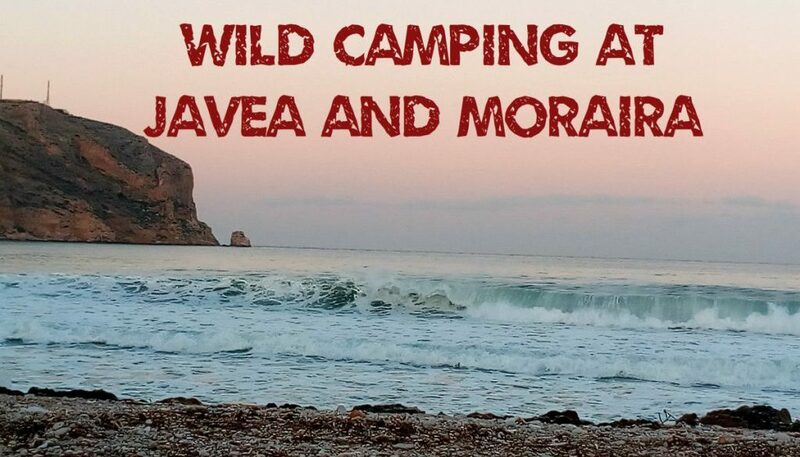 As wild camping goes its probably pretty tame – we got some directions from a Facebook friend of mine (thank you Felixa and Wayne) and parked up at the side of the road for the night a couple of streets back from the beach – opposite Mercadona! No point in throwing yourself in at the deep end! We managed 2 nights in this wide avenue. (38.783719, 0.181363). After another call out from ADAC and another jump start (as Alan had left the sidelights switched on overnight! ), we decided to calm our nerves with a couple of days on another campsite. Naranjal Campsite is at the new Arenal end of Javea – we paid €51 for three nights with the ACSI card and got a double pitch with electric and services. The campsite is a short walk from the Arenal beach and about a half hour walk along the promenade to the old town and the marina (38.770473, 0.182238). We cycled down to Arenal beach where the waves still had not abated, then from there up to the marina end of the town. The old town is built on the hill and sweeps down to a fancy marina with restaurants and cafes alongside. Within the marina end of town and totally hidden from view is the magnificent Our Lady of Loreto Church (also known as the Fisherman’s Church) which was built in 1967. From the outside it looks like a huge piece of modern art with its angular arms and struts reaching into the air, surrounded at its base by the old streets and houses of Javea. The church is a logistical masterpiece having been built in the small square in the middle of narrow streets. My pictures truly don’t do this fabulous building any justice at all. It is simply breathtaking to walk through the huge carved wooden doors into the silence of this beautiful serene building. My eyes were immediately drawn upwards to what looks like the hull of a huge fishing boat that has landed on the roof. The light cascades down through wave shaped spaces and fills the whole church. A huge crucifix hangs in the centre above the alter as if suspended in mid-air, making a very focal centre piece at the front of the church. If you are ever in the Javea area please don’t miss this incredible sight. The new town end of Javea is more commercial and touristy and has a large promenade which we were able to cycle along. The weather is turning a bit colder and the waves were crashing in off the med but I’d still rather be here than back in the UK. I’ve been chatting to a lady called Felixa on Facebook for a couple of months, shes been travelling for about four years with her partner and we’d arranged to meet up if we were ever in the same place at the same time. They proper wild camp most of the time – just checking into sites to get washing done etc. We discovered we were both in Javea at the same time and arranged to meet up. Surrounded by narrow streets, the fortress-church of St Bartholomew is located in the old town. Dating from the 14th century, it was built both as a place of worship and a place of refuge from the common attacks from North African pirates in this area. The doors to the church are lead lined to withstand attack and the walls still show battle scars. Above the door on the roof are protected openings which were used to drop missiles on anyone trying to attack the doors. Scenes from Game of Thrones spring to mind. Having spent a week in Javea, we travelled a short distance around the coast to the small town of Moraira. Here the seas were much calmer on the small beach. We wild camped on a piece of land behind the main car park and there was a regular stream of motorhomes in and out (38.690433, 0.132023). The coastal area around Moraira was full of expensive villas. So much so that I have never seen so many estate agents located in such a small area. We counted at least 20 and unbelievably, there wasn’t even a phone shop in the town when Felixa was looking for a SIM card! There is a small remnant of the old castle at Moraira remaining, but mostly it is now a marina resort town for summer visitors, full of estate agents, cafés and a main shopping street. I spied this amazing French Bulldog ornament used as decoration in a shop window. If we had the space in the motorhome, I would definitely have one of these. I know it defeats the object of downsizing, but we have owned 3 French Bulldogs in the past and bred 2 litters and they are an amazing breed of dog. Fabulous French bulldog ornament as decoration in a shop window – I want one! Modern sculpture in Moraira in celebration of shopping – opposite this is her husband, waiting and looking bored!! After 4 days in Moraira, Wayne and Felixa had to leave us to start the journey back to the UK whilst we were heading further south. You know how you sometimes meet someone and you just know you’re going to be friends? Well me, Felixa, Alan and Wayne will be friends I think for a long time. So much in common, from our views on life to our reasons for travelling – a real meeting of four kindred spirits. Oh, yes, how some meetings in life can be so wonderful! And writing blogs, sharing stories and giving info and showing pictures also means you are open minded and warm, welcoming people. Enjoy the rest of your trip! Sharing is caring 🙂 The objective of our blog is to encourage others to find their own adventure. Having a little knowledge of a location before visiting can be a tremendous help to others who have not visited before. I hope some day it will prove equally helpful to you. Thank you for your continued support.